Hello ... Hello ... my old friends ... It's great to see you once again! 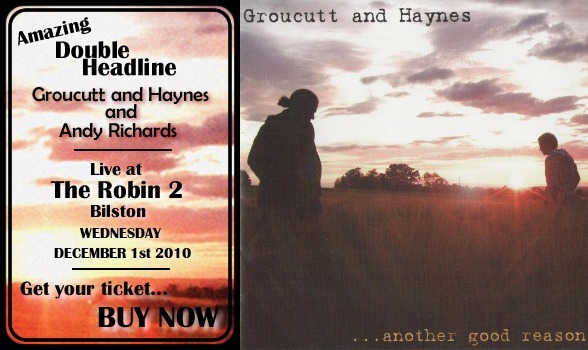 Just a quick reminder that Groucutt & Haynes are live at The Robin 2 in Bilston near Wolverhampton on Wednesday 1st December. Their album "Another Good reason" is excellent and their live show is superb. Yours Truly KJS has had the great pleasure of witnessing Rob and cohort Dan Haynes in concert on a number of occasions and the duo are well worth checking out. You probably do not need reminding that Rob is the son of the late, great and beloved ELO talisman Kelly Groucutt and is continuing his musical legacy. This will be their their last gig with a full band for a while hence this is a good opportunity to support them as we approach the New Year? ELO Beatles Forever [ELOBF] recommend Groucutt & Haynes to those enlightened folks who enjoy the music of ELO, Jeff Lynne, Roy Wood, The Move, The Idle Race, 'Brum Beat', The Beatles and related artistes.